Did you know that only 7% of children in BC meet their daily physical activity needs? Our goal should be to get at least 60 minutes of activity in each day! Being active is so important in maintaining a child’s health and well-being. Staying active helps children achieve healthy weights, develop strong bones and muscles, and decreases their risk of developing chronic health conditions such as hypertension and diabetes. Regular activity is also a means to improve energy and self esteem. Group activities are a fantastic way for children to meet new friends. We can help our kids stay active by serving as role models – make daily activity a family goal! Take the stairs instead of the elevator! Challenge each other to see who can walk the most stairs each day. Use a pedometer! We are fortunate in BC that the weather is fairly moderate – dress warmly and take a walk after dinner. Rain? No problem! Make a game out of puddle jumping! Walk, bike, or scooter/skateboard to school! Park the car a bit further from your destination. Limit screen time (TV, computers etc) to 2 hours each day. Take breaks to stretch or walk around! Play active games on the Wii. Chores are exercise! Get kids involved in vacuuming or raking leaves! Check out your local community centre. 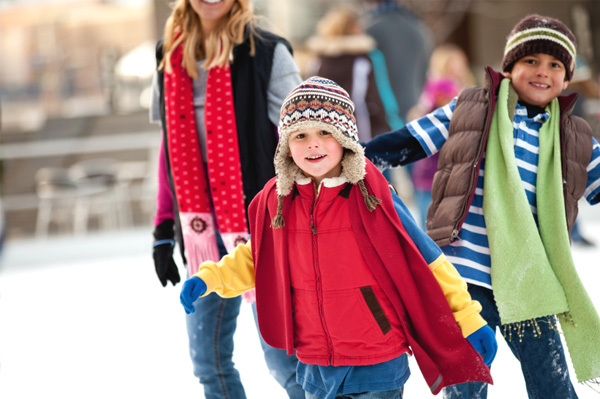 Ice-skating, skiing, and hockey are fun winter activities. Swimming, martial arts, dancing, skipping, and yoga are just a few examples of activities that can be done year round!